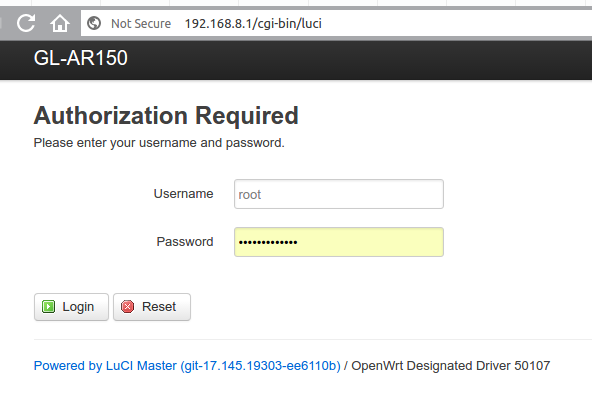 This tutorial will show you how to update OpenWRT on your GL-AR150 device, and install the Luci Essentials web UI. After doing this, resetting the device will not return you to the factory setup with the prorpietary UI from GL.inet. However, you will still be able to reset the device if you forget your passwords. The password was what was set in web UI when setting up the device. Now download and run the upgrade file. The commands below use the correct version at the time of writing this tutorial, but you should go here and search for "gl-ar150" to find the appropriate file. This appears to be a bleeding edge build from trunk, rather than a binary release. I could not find the gl-ar150 in the latest release 15.05.1. I actually had problems downloading the file directly from the site using the device. In the end I had to use the IP address of the site rather than the hostname. I put this down to a problem with my DNS, but I'm putting this here in case you have the same issue. After the sysupgrade has run, the device will take a considerable time to restart and give out a Wifi connection. Also there will no longer be any web UI. Due to these factors I started to think that I had bricked the device, but just give it time. Eventually you will be able to SSH back into the device and also see a wireless signal. Installing LuCI Essentials Web UI. Run the following commands when you are connected to the device via SSH. If you want to enable https for luci then you need to also run: opkg install luci-ssl. You may have noticed that there was a conflict with two of the configuration files. I decided to keep the package maintainer's version rather than what was there locally. To do this run the commands below to swap the files around. Now you will have web browser at 192.168.8.1. You can log in with user root, and the same password you setup before. 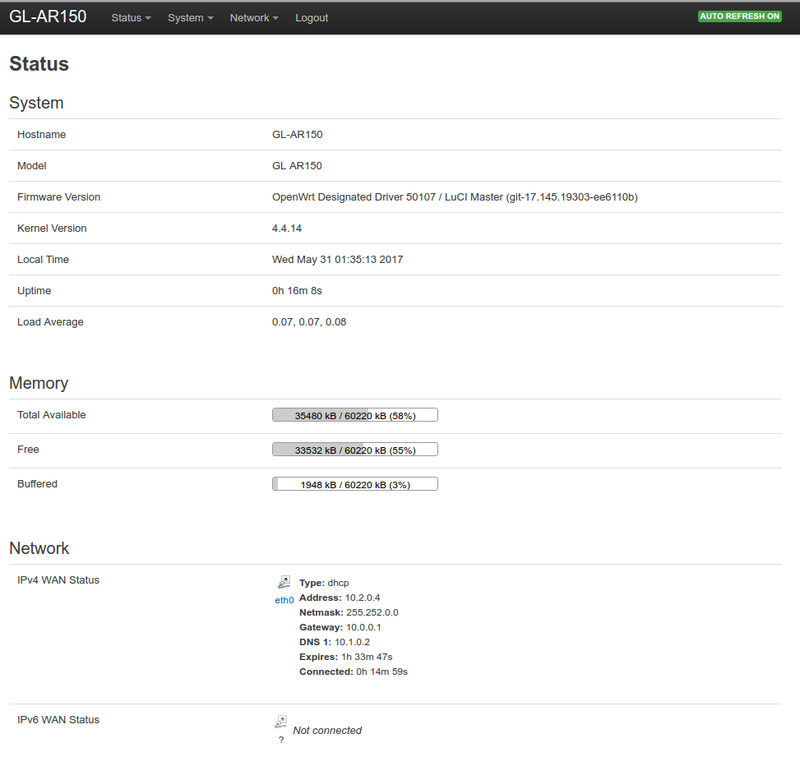 For now, you will not be able to access the web-ui from the wan port, only internally on 192.168.8.1. You now have an upgraded version of OpenWRT and the stock web-UI which is far more powerful. In future tutorials, I will focus on the things you can do with OpenWRT, such as have it route traffic through a VPN. If you forget your passwords then you can read my tutorial on resetting the device.